An ideal introduction to Hans Hoppe's political thought, readers will gain a clear understanding of the essence of his ideas about growth of government. In this tour de force essay, Hans-Hermann Hoppe turns the standard account of historical governmental progress on its head. While the state is an evil in all its forms, monarchy is, in many ways, far less pernicious than democracy. 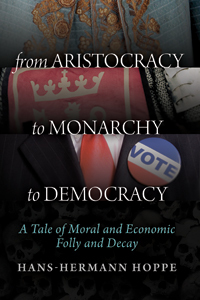 Hoppe shows the evolution of government away from aristocracy, through monarchy, and toward the corruption and irresponsibility of democracy- a long march toward today's leviathan state. There is hope for liberty, but reversing the tide will not be easy. Radical decentralization and secession, Hoppe posits, are the last best way forward. This eye-opening monograph is ideal for sharing with friends. It will revolutionize the way you view society and the state. This book is a great introduction to Hoppe's theory of the state. It is short,  succinct and written in simple language. With very little historical facts and research in the text itself, it provides an impetus to read more of Hoppe's works and provide valued criticism and /or support to his theory. A very valuable tool to open the mind of students, laymen, and professionals alike. Highly recommended for persons with little time to read such as myself. It is worth the price. In this treatise, Schumpeter introduced the phrase "creative destruction" to explain how capitalism pushes progress. This monograph engages the long-running controversy about the origin of the state. He is already a legend. His reputation will grow with time as his ideas spread. Hoppe at his best! An austro-libertarian reconstruction of man's development. Sometime in the 18th century, the word equality gained ground as a political ideal, but the idea was always vague.